The trial against Anders Behring Breivik, the Norwegian violent extremist who carried out bomb and gun attacks that left 77 people dead in Norway last year, commenced this Monday 16 April. Whilst the arraignment of Breivik eight months ago took place in a closed hearing, excluding the public and the media, it was decided that the full trial would be open with many parts of the trial shown live on television. 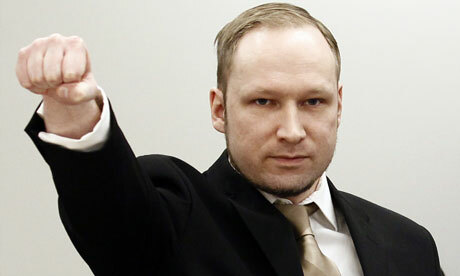 The court will not however, allow Breivik’s testimony or that of his witnesses to be broadcast. Some have questioned whether a self-confessed terrorist should be given such a platform to spread his violent ideology, whilst others stressed the need to keep the trial behind closed-doors for reasons of public order and security. On the other hand, many feel that a trial of this magnitude demands public scrutiny, to ensure that those responsible for such grave crimes are brought to justice with full respect for the rule of law and human rights. These are important points. When it comes to trying terrorists, how can we ensure a fair and public trial, without turning it into a show trial and providing a stage to spread violent extremist propaganda? One advantage to the public nature of the trial is that it provides for an unprecedented view into the dynamics of terrorist trials and the (performative) strategies employed by the various parties involved – the judiciary, defendant, victims, media, society at large etc. This “performative” approach to terrorism trials has been explored extensively by ICCT Research Fellow Prof. Dr. Beatrice de Graaf. Accordingly, trials are viewed as the stage where the different actors adopt and act out strategies with the aim of convincing their target audience(s), in and outside the courtroom, of their narrative of (in)justice. Hence, there is more to gain than only a legal victory. Trials can become a show run by the terrorists, but the stage provided can also be consciously used by the prosecuting authorities as an opportunity to demonstrate their respect for the rule of law and the potential for fair and just adjudication. After these first two days of Breivik’s trial, the strategies of both the public prosecutors and Breivik himself have become quite clear. The prosecution has chosen a factual, unemotive and highly-detailed approach to the case, providing a meticulous account of Breivik’s life and his movements, actions and the manner in which he has killed or injured each person. It is neither a Stalinist show trial nor a Hollywood-esque emotion-laden performance that wins over the judges in one sweep. Instead the prosecution is opting for a clear, detached summation of the facts. In doing so, they seem to hope that Breivik’s actual actions on 22 July 2011 inform the outcomes of the trial and public perception, not the analysis of the media, comments of talking heads or Breivik’s own court room statements. Jorid Nordmelan, a survivor of the Utoya massacre, told the BBC that “[p]rosecutors told me they were going to make the opening statements awful, so that people can just feel what he did right there”. However, the factual approach of the prosecution becomes somewhat more difficult in view of the two conflicting forensic psychiatrist’s assessment reports with the latest arguing that neither at the time of crime nor during their assessment did Breivik suffer from any serious psychiatric conditions. Breivik, on the other hand, is obviously very aware of the stage that has been given to him. Over the course of the trial we are likely to see him use this stage to the full extent to maximise the spread and impact of his ideology through symbolism and emotive actions. He is determined to be portrayed as a sane, intelligent and calculating human being, arguing against the insanity plea stating that sending “a political activist to an asylum is more sadistic and more evil than killing him”. After his handcuffs were removed on the first day of the trial, Breivik gave a clenched-fist salute – an interesting combination between a Nazi and a black power movement salute. Although he acknowledges his role in the acts presented by the prosecution, he pleads not guilty – arguing he was acting out of self-defense. Throughout the first day, Breivik showed almost no emotion, except for an occasional grin when footage was played of distressing phone calls by his victims. But when his 12-minute propaganda film was played, the self-confessed killer started to weep. On the second day, Breivik calmly and methodically set out his ideas and analysis of his actions, even showing a level of self-reflection when stating that the language he used in his Manifesto may have been “pompous”. However, whilst the stage has been set, and the two primary actors have been introduced and exposed their viewpoints in the first act, much can still happen throughout the court proceedings. Besides unexpected plot twists and changes in the above mentioned strategies by the two primary actors, it is possible to make some cautious predictions. Firstly, the trial’s primary purpose and biggest question is whether or not Breivik was criminally sane or insane when he committed the attacks. With two conflicting psychiatric assessments, a defense that – uncommonly – pleads sanity, and a public that has not made up its mind whether it prefers to see Breivik and his actions as inhumane and insane or wants him to remain imprisoned for the maximum amount of time possible, we can assume that this debate may well dominate the course of the trial. Secondly, Breivik may shed more light on the secretive resistance movement known as the Knights Templar which he claims to be a member of. During the first day of trial, the prosecution said it had found no evidence of its existence and believes he acted alone. Was Breivik indeed a lone wolf, or did he act on behalf of a (imagined) group? Some of the related propaganda material that Breivik produced has already been shown in the courtroom, but was banned from public media for the very reason of possible performativity. And thirdly, other actors such as the judiciary, media, victims and the (Norwegian) public at large may come to play an influential role, partly depending on the performances of Breivik, the defense, the prosecution and the judges. The media has extensive control over what (and how) they decide to broadcast and what they ignore. The victims are allowed to take the stand during the trial and play an active role. And the judiciary has already demonstrated its aspiration to uphold the rule of law and remove every suspicion of partiality by replacing one of the three lay judges for stating last July that Breivik should face the death penalty. The way these groups analyse and reflect upon the proceedings and their outcome will determine whether the trial will be seen as fair and just, or as a farce or show trial. After only two days, it is difficult to judge who is winning this battle over hearts and minds. Is Breivik able to convince new followers through his use of rhetoric and symbolism; will he become a hero in the eyes of those who share his concerns about the ‘Islamisation of Europe’? Is the Norwegian State able to win over those who share Breivik’s worries – but not necessarily his tactics – through a factual and unemotive approach to the proceedings? Or are they both only able to convince the public that was already on their side? The coming ten weeks will tell who performs strongest, both inside and outside the courtroom.